I have been giving a lot of presentations (on new media) in the past year or two, and have also been at numerous summits, expos, conventions, etc and sat through presentations – both good and bad. I’ve learned some things along the way about being a better presenter. Am I a perfect presenter? No. I probably even violate my own rules from time to time. But, presenting is about practicing and getting better. This isn’t the list to end all lists, either. I encourage you to add your own best tips to this list. What’s tip #11? 1. Know Your Material. OK, this one is not up for negotiation. You have most likely been asked to speak because you are considered an authority on a particular subject. Or, perhaps you’ve been asked to make a keynote speech or present an award. It is obvious when you don’t know your stuff. Try not to use notes. Being prepared and presenting in a conversational way is going to make a huge difference. I’ve found that presenting actually forces you to know your material better, and forces you to do some additional research. This also allows you to speak with conviction. The best presenters I’ve seen speak with conviction. 2. Limit Words on Your Slides. God, there are some dull PowerPoint presentations! Words only make them worse. I’ve learned from BrainRules, that humans are rules by sight. Words do not excite sight. Images do, and they help us remember content better. According to BrainRules, you’ll remember 10% of what you hear. Add a picture, and you’ll remember 65% of it. “But, I can see the text on the bullet points.” Wrong, bozo! You retain double with images that you retain with text alone. You know who does a great job of using images in his presentation? 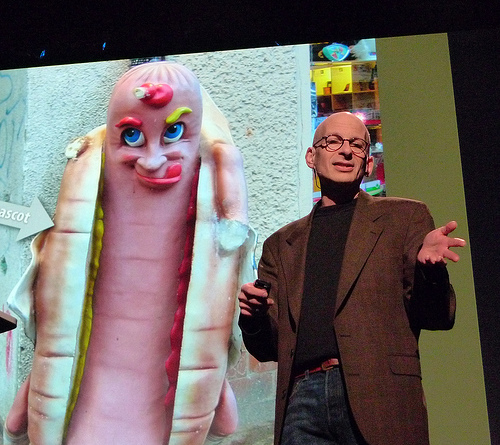 Seth Godin. He’s incredible. I watched his presentation for Tribes, and I don’t know that he used a single word – all images. And this was a long presentation – but I was engaged the entire time! 3. Freshen Things Up Every 10 Minutes. OK, I learned this one from BrainRules, too. Apparently, the human brain has an attention span of about 10 minutes (some could make a case for fewer). If you have a presentation that is longer than 10 minutes, you need to tell a relevant story, show a relevant video, or do a relevant activity. Don’t screw with the rules of the brain. They’re pretty concrete. 4. Harness Your Energy. Because it’s distracting. Many people have anxiety or nervous energy, or even excitement when presenting. That energy has to go somewhere. Often, it comes out in fidgeting or pacing. When you present, take everything out of your pockets – coins, cell phone, shrunken heads, etc. If you don’t you will, without realizing it, fidget with them and the audience will look at nothing but you toying with things in your pocket (this is not what you want!). A lot of people like to pace around when they present – they think it gives the presentation energy. Wrong! It’s distracting. Movement can be strong in a presentation, though, and sometimes there is strength in approaching a person in the audience or referencing a visual aid. However, I gained a tip years ago that if you feet are moving, your mouth shouldn’t be. Skeptical? Try it – it works well. Otherwise, people will watch you pace back and forth and not hear a word you say. 5. Nix the Verbal Ticks. Um, er, uh, you know, such as. These are examples of verbal ticks. They’re those little filler words we mutter when our brain is taking a breath. But, like pacing, verbal ticks can be extremely distracting. Often times, when I notice a presenter is “umming” or “ahhing” I get so obsessed with predicting the next “um” that I can’t pay attention to what is being presented. Not too long ago, I actually starting tallying “ums” and got to about 100 in about 15 minutes. Sad thing is, I don’t think the presenter knew she was leaning on verbal ticks so much. So, record your next speech, or have a friend in the audience critique you (including looking out for your verbal ticks) and see if you are a victim of subconscious verbal ticks. They’re deadly. 6. Know Your Audience. Truthfully, this is probably one of the more important tips for presenters. If you don’t know about your audience, you don’t know what they want to learn about, what they’ll respond to, what jargon they will or won’t understand, what’s offensive to them or what’s important to them. If your contact can’t give you information about the audience as you’re preparing your presentation, just get as much info as you can and resolve to take a straw poll of your audience before you begin. If you’ve obeyed the rules of knowing your material and using more images than text, you can adjust your presentation on the fly and rock it hard. t also helps to meet some of the audience members ahead of time and chat with them. Ask them questions that will lead them to tell stories about experiences that you may be able to reference during your presentation as a segue or a great example. It’s super-strong to be able to say, “Karen and I were talking before we got started, and she mentioned her frustration with ___.” Of course, be aware of anything that may be too private. 7. Have Sticky Eyes. This isn’t as weird as it sounds. It’s about eye contact. Some presenters scan the room non-stop as they present, never landing on a person. Some presenters gaze into their laptop screen or stare at the projector screen. Some just stare at the back wall of the room. This is keeping you from connecting with the people you’re presenting to (oh yeah, those peeps). Make eye contact and maintain it for about three seconds. When moving on to the next person, imagine that your eye-contact is stuck and you can only separate it as though you were stuck with glue. This prevents you from the typewriter-style, shifty eye-movement from one person to the other. Sticky eyes translates as more genuine eye contact and makes them feel like you’re talking to them – it keeps them engaged. 8. Don’t Hand Stuff Out. People will look at whatever you give them and will not listen to you. If you do want to give people handouts, tell them that you’ll provide a handout with more information after the presentation. 9. Don’t Turn Off the Lights. OMG – major offenders. Remember in high school when the substitute teacher would turn off the lights and turn on a movie? You’d put your head down and fall asleep. Same thing happens now. People will fall asleep if you turn off the lights. Guarantee it. If you need to, dim the lights near your presentation, but don’t ever turn the lights off. Adjust your visuals if they can’t be seen in a lighter setting. 10. Scope It Out. Know where you’re presenting, and request to check it out ahead of time. Know how big the stage is, whether you’ll have a podium or not. Know what kinds of tech hookups you have. Do you have outlets, a projector, a screen, speakers? Are you bringing the presentation on a disc, on a jump drive? Are they compatible with the equipment in the room? Hook up any equipment you’ll be using to present and do a dry run to ensure everything works well. Above all else – and I’m not assigning this an official number – be a likable person. If the audience doesn’t like you, they won’t listen to you. Be a person. Use voice inflection, use facial expressions, show excitement and emotion. It’s OK to be a person. PLEASE add to this list so that I (and my readers) can become better presenters.